Today, June 26, the U.S. Supreme Court issued its ruling in D.C. v. Heller. The High Court struck down the District of Columbia’s law banning all handguns, even in the home. 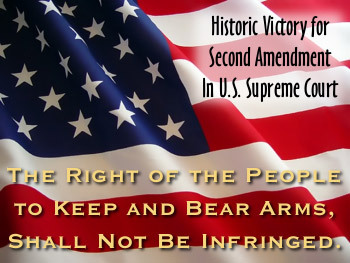 In reaching this result, in a 5-4 ruling, the Supreme Court affirmed that the Second Amendment secures to all Americans (not just those serving in a militia), a right to “keep and bear arms”. This applies both to hunting and self-defense. This is an historic decision that springs from the very foundation of our Republic. The scope of the decision was broader than expected by some legal experts. We do expect some other gun laws to be challenged in the wake of D.C. v. Heller. On the other hand, the High Court did acknowledge that some firearms regulations are both necessary and legitimate, so don’t expect a wholesale dismantling of gun laws nationwide. Victory for Now — But What Looms Ahead? It is time for gun-owners and shooting sports enthusiasts to celebrate. But keep in mind that it is possible that one or even two High Court Justices may retire during the term of the next President. If that President is a Democrat, one could expect an anti-Second Amendment judge to be appointed. So…the fight never ends. Share the post "Supreme Court Rules Second Amendment Confers Individual Right"
The 5-4 decision in D.C. v. Heller represents a great victory for advocates of Second Amendment rights. 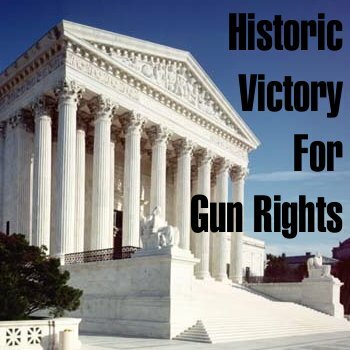 Gun owners nationwide, and all who support the rights of free men in a democracy, should indeed celebrate this ruling. However, the battle is far from over. Gun advocacy groups must NOT become idle or complacent, saying “Great, we won, everything will be fine.” The battle has just begun. It is now more important that ever for the NRA and all organizations supporting gun rights to re-double their efforts to challenge unconstitutional and burdensome laws. As reporter Charles Weller wrote famously: “Now is the time for all good men to come to the aid of their country.” The hard fight is just beginning. The decision in the Heller case provides legal ammunition to continue the fight — both to oppose new anti-gun legislation and to challenge existing laws which infringe on individual rights to keep and bear arms. Personally, I would like to see this Supreme Court ruling spawn dozens of legal challenges around the country. It’s time to go on the attack. We have an opportunity now that may come just once in a century. It’s time to get committed and fight for our rights. Groups like the NRA should start “earning their keep” and lead the effort to overturn existing unconstitutional gun regulations. Share the post "OK NRA… Now Take the Ball and Run"